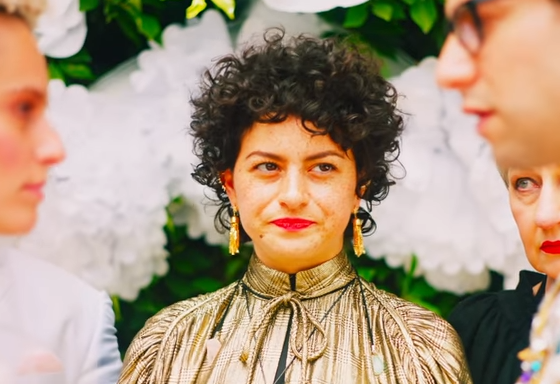 Alia Shawkat (from one of my new obsessions, TBS's Search Party) makes an appearance in the 80s-tinged, lo-fi music video for what has become one of my favorite songs of 2017, "Don't Take The Money" by Bleachers. The offbeat direction is courtesy of Lena Dunham, girlfriend of frontman Jack Antonoff. In the vid, a bizarre wedding unfolds in a New Jersey backyard that has been decorated with plethora of items probably purchased at a 99-cent store. And it works, reflecting the song's undeniable charm. Earlier this spring my pop culture sixth sense told me that Dunham would be connected to the song somehow. I actually thought I'd hear the song pop up in the final season of Girls, but this'll do.